BentoLunch.net - What's for lunch at our house: Muffin Tin Monday - Breakfast Time! Muffin Tin Monday - Breakfast Time! Time for Muffin Tin Monday again! Since there is no theme this week, we're going with breakfast as our theme. It's kind of nice to have these already sitting in the fridge for F&B to grab when they get up in the morning. They usually have cereal, so I'm enjoying shaking things up a bit! So what's for breakfast at our house? Strawberry yogurt, orange juice, cantaloupe, boiled eggs, zucchini-chocolate chip muffins (homemade, of course), and strawberries. Lots of the kids' favorites in one little tin! Oooo. I just got a zucchini. I'll have to see if you have the recipe posted somewhere! wow, that's lovely! great idea to serve muffin tin breakfast.... definitely coming back to snag that zucchini muffins recipe! I think this a wonderful breakfast. Yum! 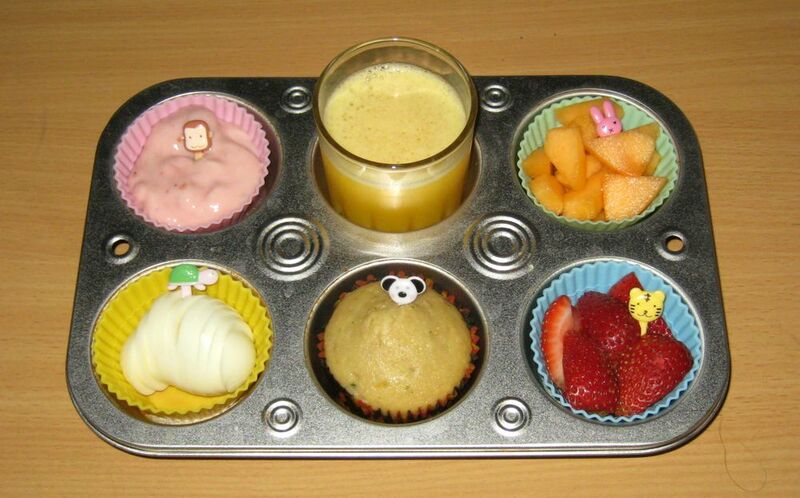 Great breakfast, the muffin looks delicious! Everything looks great! Am I weird because I think the best looking thing is the orange juice??? :-) I'm a juicehead! Oh I must have this recipe too! I'll be sure to check back in tomorrow! I just have to say this is the cutest Idea I've ever seen! Excellent breakfast! I need to get a smaller tin so I can leave breakfast for Kidlet like this! Too cute! Love the breakfast muffin tin! I will have to try that for Paulo, I'm sure it would get a smile from his tired little face. I did something similar on Friday myself.